Who is obsessing about what food right now? We have the answer. Boy, have America’s taste buds changed over the years. We used to be a steak and mashed potatoes nation. Meat and veggies were an American staple since we became a nation nearly 250 years ago. Now? It’s all over the place. With the internationalization of cultures, and the advent of social media, we’ve really expanded our food palettes. Sushi? Hummus? That used to be the stuff that ‘other’ countries ate. We’re not going to speculate on whether our food choices are decided by trends, and where our appetites will head next. But for now, let’s just say that Americans in each state have very distinct interests. To figure out which food each state likes the most, we simply had to turn to Google to see which food each state was searching for the most. The answers were all over the place. 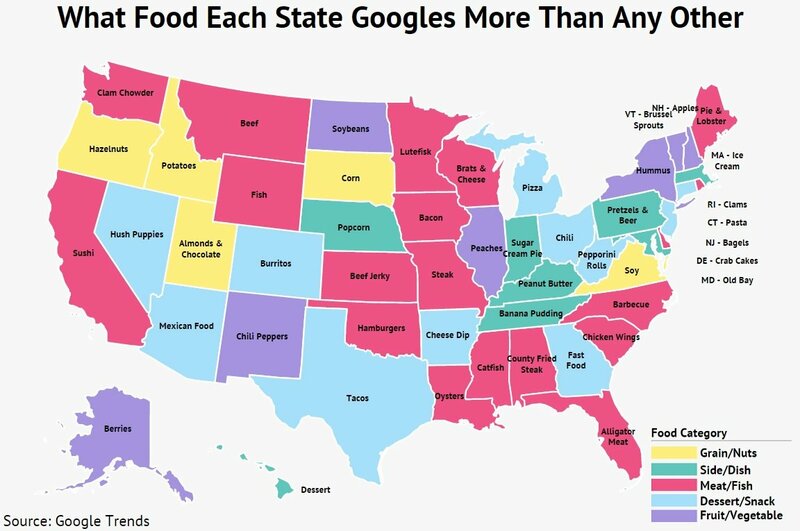 Some of them make sense: In Idaho, people like potatoes, and in Texas, they like tacos. Duh. Georgia eats lots of fast food, and Californians love their sushi. New York loves hummus and Arkansas? You can have your cheese dip. Check out the fascinating map below. We’re getting hungry just reading it ourselves. It’s pretty important to read the title on a graphic before writing an article about it.